By default, Bamboo accepts communication from all repository hosts that authenticate with SSH. 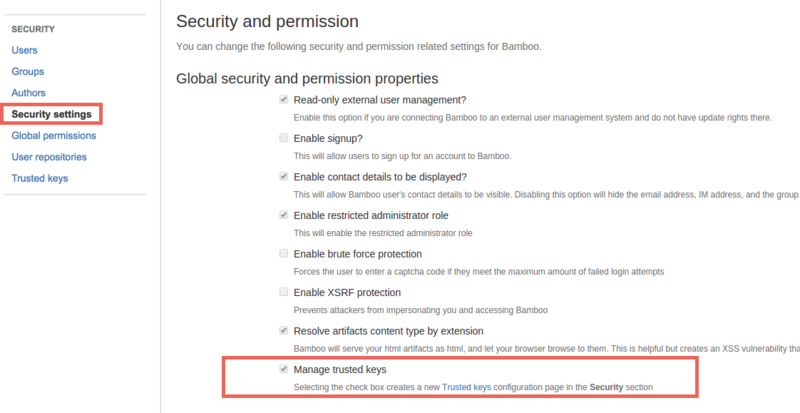 You can secure communication between Bamboo and repositories by setting up trusted key management. Prevent Bamboo from connecting to unauthorized services via SSH. Manually authorize SSH key of the repository hosts upon first connection. Automatically authorize repository hosts that were added to the trusted keys list. 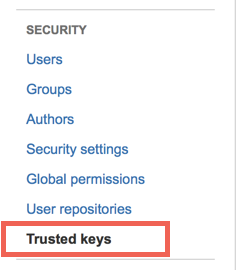 Trusted keys management is available only for restricted administrators. Go to Administration > Security > Security settings > Global security and permission properties. You can manage the authorized public SSH keys in the Trusted keys page. Go to Administration > Security > Trusted keys. Paste the public key that you generated for your repository host and click Add.